Finding ore in Vintage Story can be challenging, so to help you out here is how the game spawns ore. To the right, there is a picture of a typical ore distribution in Vintage Story. 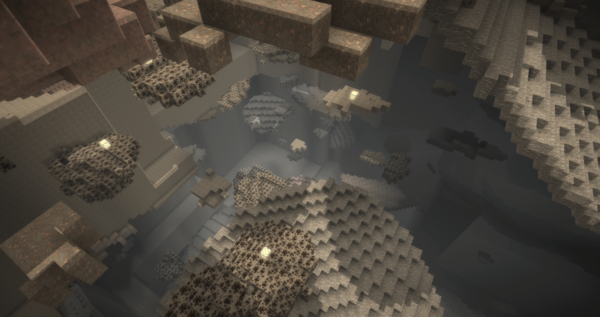 The main thing to notice is the ores are distributed at random heights in disks at various angles. Some ores have wider disks than others. Quartz by far as the widest disks but most disks are around an average of 5.5 blocks wide. These disks typically are shaped similarly to the surface above but always cover the same horizontal area. Meaning in regions where the ground is flat the disks will be flat and where the surface is jagged the disks will be tilted and distorted. That means in flat areas horizontal mining has less of a chance to hit the disk then vert mine shafts. This continues to be true until the surface is jagged enough that its slope is greater than the disk is wide. For vertical shafts, the chance of hitting an ore disk is always the same and horizontal shafts the chance depends on the shape of the surface generally. Here is the page for more information on the prospecting pick and how to use it. All ores are uniformly distributed through the ground. Rarity is the average amount of ores per chunk. Shallow ores stop at a certain depth. Deep ores go from the mantle up to a Y max. Gold and silver only spawn in layers of quartz. Following a quartz layer is a good way to find them. Ore blasting bombs can be utilized to great effect to clear out quartz. There's a .003% chance to come across a massive cassiterite deposit in a chunk. If you do consider yourself extremely lucky, since the smallest of these deposits are larger than the largest of the normal sized deposits. Lapis only spawns in claystone. This page was last modified on 6 October 2018, at 13:34.